Skid resistance of a waterproof system for pool areas. The area around a pool has to be both water-resistant and skid- proof. The two are not mutually exclusive though, with the right materials and knowledge you can create a resilient and water-tight pool area with built-in anti-skid properties. Pools are a constant source of water and splash. Over time, the chemicals and water will damage your concrete pool deck. A top-notch sealant is imperative to maintain the integrity of your concrete. The importance of keeping your pool area safe and water-tight cannot be overstated. The right pool deck surfacing will incorporate both anti-skid features and a resilient tough finish designed to weather all conditions and traffic patterns. Pools are notoriously dangerous areas, a lot of hard surfaces prone to slippage when wet. The correct finishes for your concrete pool area will eradicate unsafe conditions. Before starting your pool deck job, make sure you have all the information you need to create a safe and attractive surface. 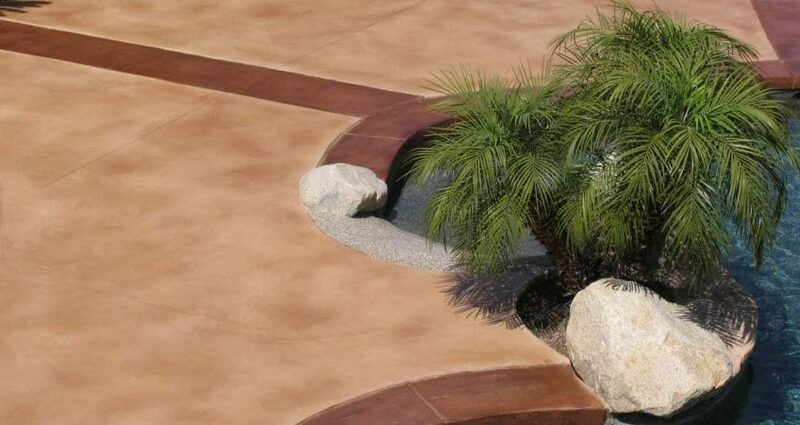 Your concrete pool deck needs to be water- tight, attractive and skid resistant. Many states require advanced skid-proofing for pool decks due to the amount of injuries that occur around pools. Slip and fall injuries in pool areas are considered the fault of the home-owner or the facilities manager almost exclusively. Proper pool deck surfacing is how you meet that challenge. There are a lot of choices in materials and techniques for creating a safe pool deck, we will discuss a few of them. How skid resistance is incorporated into concrete pool sealants. Many concrete sealants offer products that can be added directly to the sealing material. These are usually ground-up polymers with a consistency similar to sand. When applied with the sealer, they bond with the polymer base, creating texture and grip above and beyond the polymer itself. These additives come in all shapes and particle sizes, before sealing your pool deck, look into them. The dry particle broadcast method. This is another tool to use when keeping pool decks slip-free. Instead of mixing the particles in with the sealant, the material is broadcast liberally over the newly applied sealant before it dries. Often a combination of both approaches; mixing in and broadcasting dry is used by contractors. Penetrating sealants, a different approach to sealing concrete. Penetrating sealants are a different approach to solving skid issues on a concrete deck. The sealant actually penetrates into the concrete and leaves no surface or “shell” on top of the concrete. Because there is no slick surface associated with polymer sealants, the pool deck retains its natural concrete skid-resistance when wet. A slightly rougher finish texture to the concrete aids in stopping slip and fall incidents. Penetrating sealants are generally very effective and long lasting. A different kind of textural approach. Often contractors will incorporate rock and pebbles and multi-textured materials into the concrete work while it is being installed. This approach uses natural (or aggregate) materials designed to reduce slippage and be attractive at the same time. This kind of artistic decking has multiple uses; it enhances poolside appeal while ensuring better footing. A recurring design motif or pattern can be incorporated into the pool deck in a multitude of colors and texture choices. This is a more expensive choice in pool deck construction, but well worth the effort and expenditure. Choose the right materials and the right information. There are a lot of choices out there when it comes to pool deck surfaces. Always get the information you need before starting a job. Pli-Dek the products, the knowledge and the experience you need to do the job right. When you are ready please contact us.